Joan Palminteri 87 of Carol Stream. At Peace with Christ, Thursday, November 29, 2018. 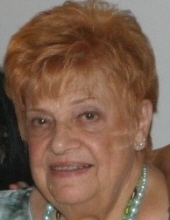 Beloved wife of the late Robert Morelli. Loving mother of Lynn (Rocco) Queeno and Rose (the late Wally) Pawlowicz.Beloved daughter of the late Vito and Rose Palminteri. Fond grandmother of Joan, Ron, Natalie (Mark) and Rachael. Great grandmother of Riley, Dustin, Bella, Gia, Olivia, Ronnie and Leo. Dear sister of the late Josie, Frank and Carl. Fond aunt and great aunt to many. Visitation Sunday from 2:00 to 7:00 P.M. at Cumberland Chapels (FRIEL FUNERAL DIRECTORS) 8300 W. Lawrence Ave., Norridge. Funeral Services Begin: Monday 8:15 A.M. at the Funeral Home and will proceed to St. Michael Church, 456 W. Eugenie St., Chicago. Funeral Mass 9:30 A.M. Interment St. Joseph Cemetery. Info 708-456-8300. To send flowers or a remembrance gift to the family of Joan Palminteri, please visit our Tribute Store. "Email Address" would like to share the life celebration of Joan Palminteri. Click on the "link" to go to share a favorite memory or leave a condolence message for the family.